It’s nice being organized, isn’t it? I enjoy having everything in its right place, a pocket for this, a compartment for that – especially while I’m on the road. But traveling and staying organized is easier said than done. It’s surprisingly simple to be left tearing your hair out when everything gets messed up. This can be particularly true when it comes to your electronic equipment and devices. Because try as you might, you can guarantee that even though you neatly wound up your earphone cable, by the time you retrieve it from your pocket it’ll be more tangled than a plate of spaghetti. And not only that, packing chargers, batteries, SD cards, power banks, and other essential kit can be a logistical nightmare – even more so if you’re short on space. With that in mind, I’m here to help you avoid that mistake with a guide and review of the best electronic organizers for travel – and I’m not talking about those digital diary/calendar/address books from the 1980’s. Pick up one of these bad boys and you’ll wonder what on earth you did without it. As ever, a handy buying guide will follow the review. 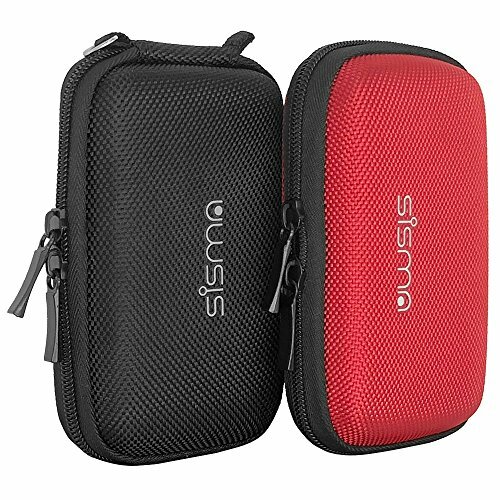 This is a two-piece kit which comes with a red and a black organizer. 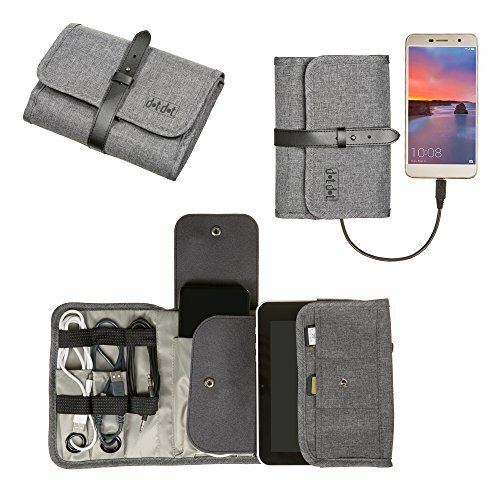 One case can be used for carrying a small battery or device, while the other can hold wires, cables and such in the mesh pockets. One opens like a clamshell, the other like a book. It’s a semi-hard construction that will protect your electronic accessories from most moderate wear and tear. The slim design ensures they’re not going to take up too much room in your backpack or luggage. A little on the basic side if you’ve got a lot of gear. This is a no-frills product that is perfect for those with only a few accessories to store, but you should look elsewhere if you need more space. It’s not the best travel cord organizer out there – but it will do the job for the basics. 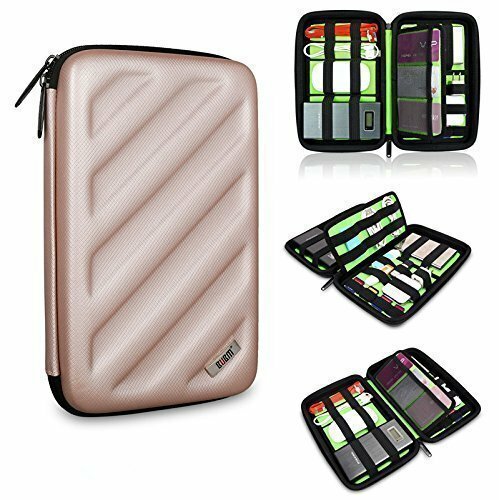 This compact case is made from Pu coated 300 Denier Polyester and comes in so many funky colors and original designs you’re going to be hard pressed to choose one. They certainly make the case pop. As well as internal elasticated mesh pockets to store cables and earphones, it also has a pen holder and exterior pocket for those easy-to-reach items. A great size and weight to slip discreetly into any other luggage, handbag or briefcase. Loads of designs to choose from. Not as durable as a hard/semi-hard case. Don’t let the really cool designs fool you – this is a beautiful and well-constructed case that will keep all your kit organized. If you’re not packing a lot of stuff, its functionality, size, and weight could well make it one of the best cable organizers for travel available. This ProCase offering comes in an attractive wallet-style design that folds over and secures with a toggle. It’s made from a heavy-duty, durable, water-resistant nylon. Its versatility means it can also be used to store healthcare, a grooming kit or cosmetics for travel. There are plenty of mesh and slide pockets inside, along with elastic straps to keep cables tidy. Some might not like the “open-ended” wallet-style. A really nice-looking product from ProCase, this versatile organizer can be used to house a variety of kit – whatever suits your needs. While splash-proof, the wrap-up wallet design is still likely to let dust and water in at the ends through – which could be a major niggle in the long run. Here’s another versatile organizer that can be used for different accessories – not just electronics. 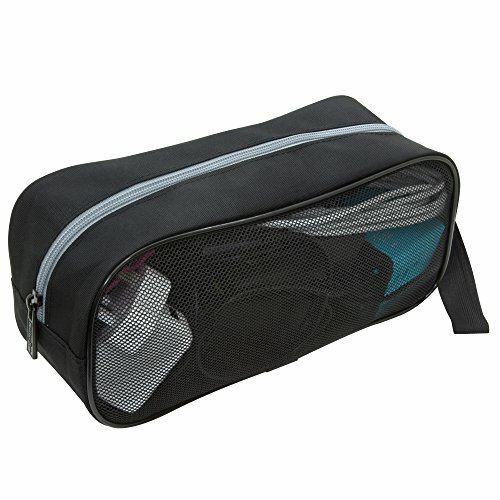 It’s a washbag-style design with one main compartment, and two internal mesh pockets built in to keep everything from rattling around. The larger compartment is excellent for storing bulkier items – such as laptop or DSLR camera battery chargers. It’s the only bag in the review that is really suitable for those accessories. Could still get messy inside. 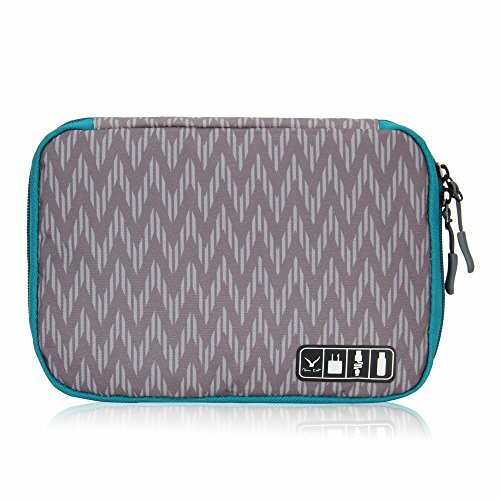 This is a great bag for transporting larger power banks or cables, but it’s not particularly ideal for smaller items such as earphones, USB dongles or SD cards. And with the lack of dividers, mesh pockets or elastic straps – things might get hectic inside during transition. You can rarely go wrong with AmazonBasics, and this neat little organizer continues the trend. It’s a semi-hard case with molded EVA-plastic exterior. Internally it contains several mesh pockets to store batteries and smaller electronic devices. If you’re looking for one of the best electronic organizers for travel then look no further – its simple, no-nonsense design is one of the most popular products available and is surprisingly roomy inside. A great little offering from AmazonBasics which is perfect if you’re on the go. The first in a few entries for BUBM sees this wallet-style organizer made from heavy-duty, durable waterproof nylon. Covers are well-padded in a tri-fold design which clips shut and is held with the help of an elasticated band. Internally, there are loads of mesh pockets and elasticated fixings, great for storing cables, SD cards, batteries, and flash drives. It’s very thin – will only really fit flat or slim accessories. A smart wallet with so many compartments to organize your kit – it makes you wonder if you’ve got enough stuff to fill it. While it won’t take the bulkier items, it’s definitely one of the best travel cord organizers available. A practical, tri-fold wallet design from Dot & Dot, this water and scratch resistant organizer seals shut with a snap-pocket. Preferring material sections to mesh compartments, they claim this design to be the end of items falling from loose elasticated bands. It also includes charging holes so you can connect your devices to the stored cables without removing anything unnecessarily. A versatile design that can hold other items such as your passport, extra cash or other documents. Again – the wallet style not completely closed to the elements. This is a really smart, functional design that makes great use of its internal space. I particularly like the ability to use power chords without having to remove them from compartments. This makes it a good shout for one of the best travel cable organizers on the market. Another entry for Hynes Eagle should come as no surprise, and this book-opening style pouch is a practical addition to their portfolio. 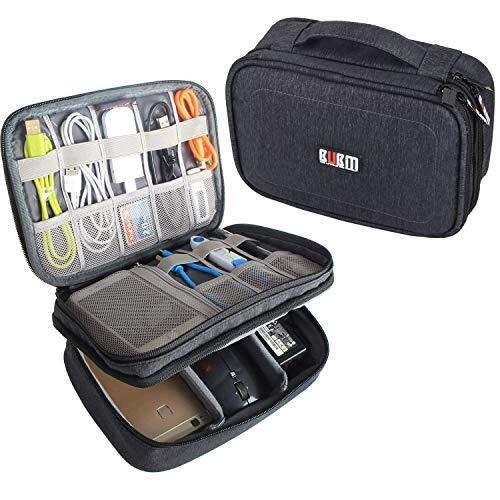 Its polyester with PVC coating construction ensures that it’s durable and water resistant, with plenty of mesh pockets and elasticated compartments to store cables, chargers and other bits and pieces. It’s also one of the lightest products out there and only 0.3 lbs when empty. Super lightweight and slim design. Choice of colors and designs. Not as tough as a semi-hard case. Too slim for bulkier kit. This organizer does exactly what it says on the tin and I’m a fan of its well thought out internal design. Now we start to pack a bit more punch with BUBM’s double layer bag – for you folks who carry a lot more cables and gear than the average Joe. It’s made from the same durable, water-resistant nylon as other bags in the line, but this basically contains twice as much room in a book-style opening. It’ll even pack an iPad Mini with ease. Can also be used as a cosmetics bag, or to store other, non-electrical items. Loads of cable and cord space. Not suitable for larger accessories. A great bag if you’ve got cables coming out of your ears. Hard drive cases should have a tough exterior as standard and this BUBM option is no exception. It also incorporates plenty of features to hold other electronic accessories. It’s made from EVA material to keep it very water-resistant and durable. Great for having that little bit of extra protection for all your gear – even if you’re not transporting a hard drive. It packs 25 elastic loops inside, so plenty of places to store all your cables and accessories. Not suitable for bulky items. 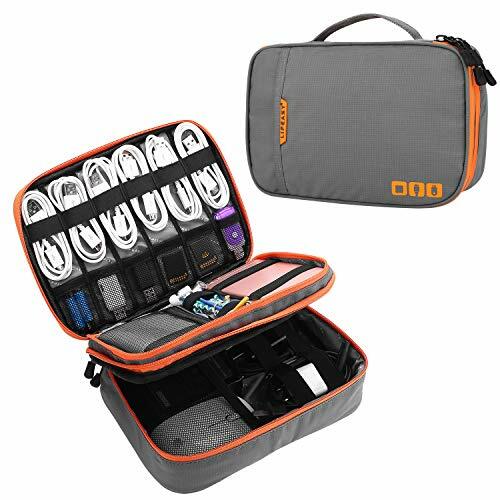 A great hard drive case that also happens to be a travel organizer. Perfect if you want a sturdier, more durable case than the wallet-style designs. Now we’re talking! This bag comes with padded inserts in the lower compartment so it’s almost like a camera bag. It means you can store bulkier accessories such as laptop chargers, mice or web cameras. It’s very capacious in its design, with plenty of cable tidies, mesh pockets and the ability to comfortably hold an iPad Mini. The larger version will even take a standard iPad or similarly sized gadget. It comes in a choice of colors and two sizes, but you can choose a 3-piece set if you need more storage too. It’s on the bulkier side. 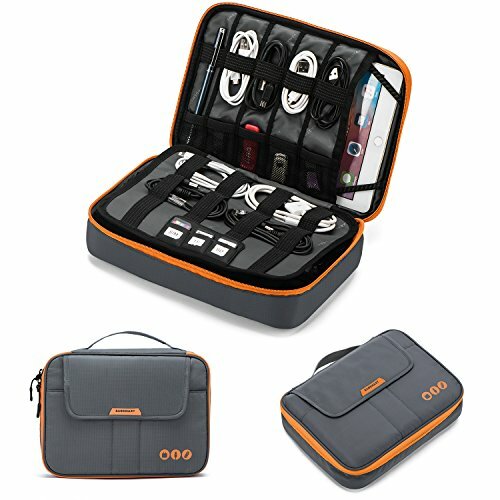 This is easily one of the best electronics travel organizer bags for its space and versatile interior. I particularly like the adjustable padded inserts to cater for your own personal needs. It is a little larger than other offerings here though – only for those who really need the extra room. We’re getting to the point of paying a little more for your electronics organizer (even though they don’t ever get into silly figures). This number from Rexso is a stylish case made from durable, water-resistant nylon. It can hold a ton of kit in its double-layered design. They also come in different sizes in the range, so you can order the right size for your needs. Each size makes use of the space available in a practical fashion. Really nice-looking case in orange or black. Padding could be a little thicker. These are really well-made bags in a sporty style – great for travel or just generally getting organized in any situation. I’ve included another hard drive case here because I think this one is versatile enough to be a really useful electronics organizer. 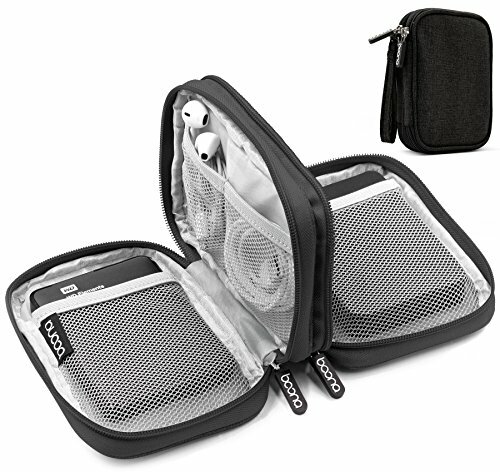 It’s a solidly built, yet compact case that can store two hard drives – but you can mix and match your kit in these mesh pockets to suit your needs. It’s also available in a two-pack if you need even more space, or why not give one as a gift? Solid zippers and hand strap. Not suitable for larger items. A well-built carry case for delicate items, there’s still ample compartments for cables, cards and flash drives. I think it’s a top travel option. As a travel cable organizer, this number from Bagsmart certainly looks the business, available in a choice of colors. It’s a really smart design that’s well built and smacks of quality. The water-resistant, durable nylon and double zipper will keep your kit safe from the elements. As well as having bags of room inside with all the trimmings, it’s got two handy external pockets for quick access to whatever you need – such as a passport or driver’s license. Generally, there are loads of storage options to cater to every accessory you own, including a 9” tablet or similar device in a special sleeve. Price is a little on the high side – comparatively speaking. A stylish, multi-use bag that can hold plenty of gear, the only downside is that it’s quite pricey compared to its cheaper brothers. 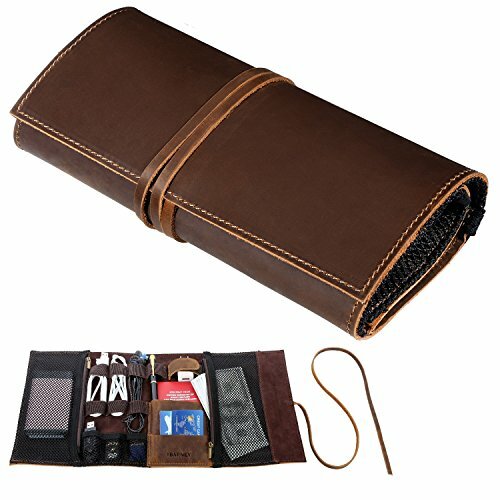 For something a little bit special, my last entry in the review goes to this genuine leather electronics organizer – which would make a great gift or if you’re looking to add a bit of class to the proceedings. It’s easily one of the most stylish products in this field, perfect for business or more formal trips. 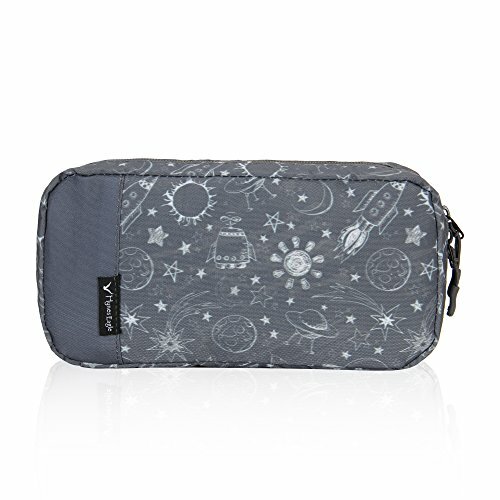 It’s really charming as an overall travel organizer, to keep the things you need altogether while you’re on the move. You might not use it for electronic accessories at all. An aesthetically pleasing piece of kit that wouldn’t be out of place at any business meeting. The problem is that it looks a little too good, so don’t be leaving it around unattended for any length of time because I’ll bet my bottom dollar it will go walkabout. You might just want to jump right in and pick the product you think will best suit your electronic tidying needs, but if you’d like to take a minute, here’s some useful info that just might help you make your choice. 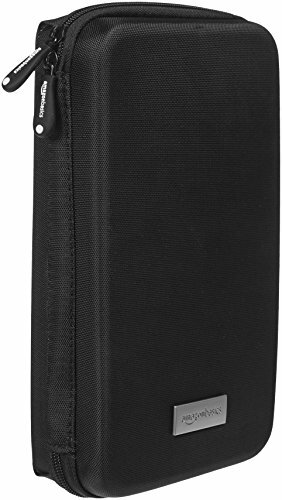 The best electronic organizers usually have the same or similar design – a book-style zipped case with various dividers, pockets, mesh, elasticated bands, and compartments to store all your gear in. Some designs are more like wallets or purses. Others might be more like a pouch or in a wash bag style. Some are very similar to packing cubes which are extremely useful items when it comes to keeping all your belongings organized on any length of trip. The style you prefer will no doubt depend on what you need to keep organized and where you’re likely to be taking it. Cables, wires and other knick-knacks are almost as important as the electronic devices themselves – and anyone who’s ever been unable to use a broken charger will testify to that. It stands to reason then, that a good electronic organizer will be sturdy enough to protect all those essential items that keep us plugged into the world. Bear that in mind if you’re thinking of saving a few pennies with a poorly made budget option. Organizers come in a variety of materials such as canvas, leather, nylon, plastic or otherwise. Again, it’s down to personal preference and what you like the look and feel of. However, different materials will have their plus and minus points, such as how heavy the product is or, perhaps most importantly, its water-resistant qualities – or lack thereof. Nobody wants a soaking wet battery pack or power bank, and if you choose to keep important documents in there too – you’re asking for trouble if you’re caught in a monsoon in Thailand with a product that’s as waterproof as a napkin. If you’ve got lots of stuff – get a larger case. Simple. But remember that some organizers can take up more space than you might think. And while these products aren’t exactly going to break your back when transporting, weight soon adds up quickly when you’re packing for a trip. If you’re intending to travel as light as possible, choose an organizer that reflects that. You shouldn’t have to make it a choice between this and a first aid kit if you’re climbing a mountain. These things have one job to do – keep your kit in order. They should be packing loads of features for them to accomplish this. 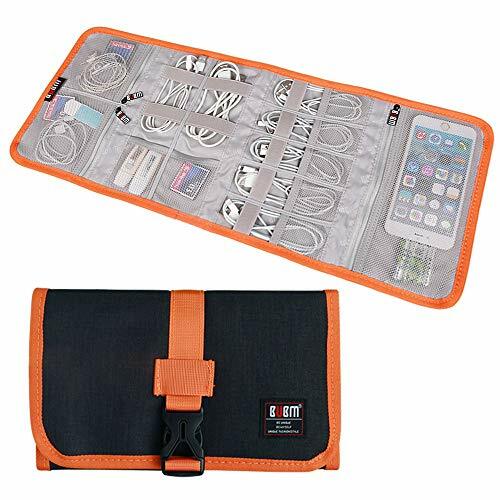 Electronic organizers will come with various pockets and compartments specifically designed for each individual item. 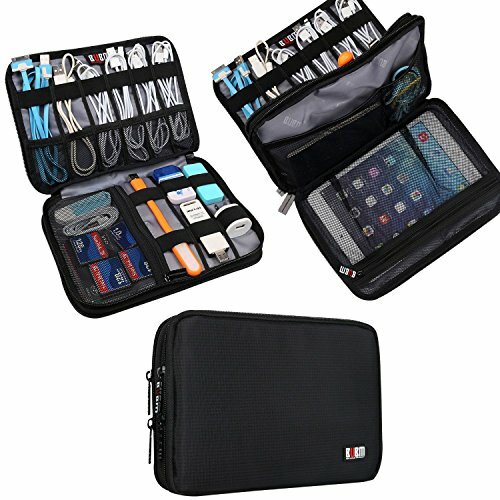 SD card pouches, cable tidies, notepad or kindle holder, battery sections… it should all be there. And the best cable organizer bag will also offer additional storage for non-electrical items such as your passport, driving license, or photo of your mom. You’ll find that all of these organizers incorporate one, two or all of these features to keep your kit from coming loose when you’re on the go. It’s still worth mentioning here though, as they all can wear over time. Elastic can lose its ability to grip things in place and become loose, mesh can develop holes that allow your stuff to pass through and zippers can break easily or not open and close at all. Make sure when you’re choosing the best travel cable organizer you take these things into consideration and do your research. You don’t want it falling apart on you after a few uses – so look out for those made with care and quality. The best electronic organizers for travel will come at a price, but thankfully this time, that price isn’t exorbitant. You shouldn’t be paying any more than thirty bucks for one of these unless it’s made from 24-carat gold and diamond encrusted, and to my knowledge, they’ve not made one of those – yet. There’s a great selection of the best electronic organizers for you to choose from, so you shouldn’t have any trouble making your decision. To be perfectly honest, the market isn’t exactly saturated with this kind of product, which should make your task a lot easier. At the time of writing and with a few exceptions, what you see here is pretty much what you get – or variations thereof. Let me know in the comments which design you’re likely to go for and why. Good luck and happy organizing!